Anyone with a car and valid license (with at least 1 year’s driving experience) can sign up to be a Hitch Driver. There is no obligation to do rides on a regular basis because you are NOT a taxi or commercial car service! You choose who to pick up and when to do so, so every GrabHitch ride is entirely at your convenience. You never know who you will meet on GrabHitch – Hitching a fellow NTU alumni member, colleague, a prospective client or maybe even a long-lost friend! If you pick up and drop off one person to and from work everyday, you can potentially recover enough money to cover your petrol and parking fees. Signing up only takes 5 minutes and you can do it straight from your mobile phone! Simply open the Grab App and follow the steps below. 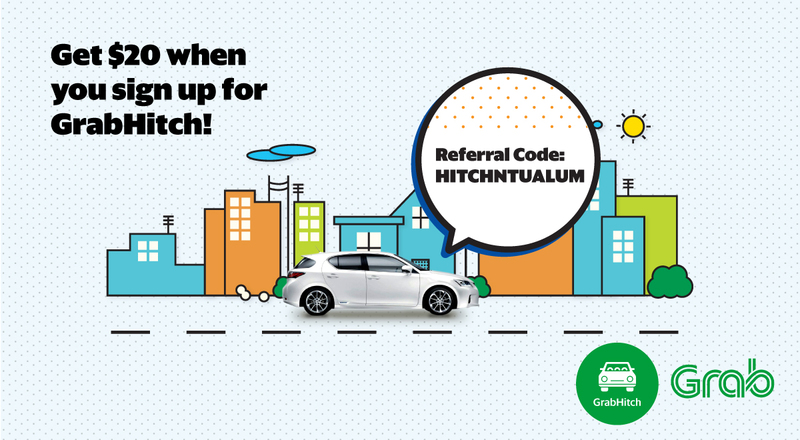 Get $20 credit in your driver wallet when you sign up and complete your first GrabHitch ride as a Hitch Driver with referral code HITCHNTUALUM! *Your application will be approved in 1-3 business days. Step 2: Create a route based on where you are, and where you want to go at a specified time/date. Remember to indicate how many available seats you have, and whether you prefer a same gender rider. This incentive is only eligible for new drivers who sign up with referral code HITCHNTUALUM and successfully complete 1 Hitch ride as a driver within the stated period. For drivers who sign-up from 1st September – 30th September 2017 and successfully complete a ride in this period, the processing of the $20 credit will be conducted post 30th September. For drivers who sign-up from 1st October- 31st October 2017 and successfully complete a ride in this period, the processing of the $20 credit will be conducted post 31st October. For drivers who sign-up from 1st November – 30th November 2017 and successfully complete a ride in this period, the processing of the $20 credit will be conducted post 30th November. For drivers who sign-up from 1st December – 31st December 2017 and successfully complete a ride in this period, the processing of the $20 credit will be conducted post 31st December. Please allow up to 10 working days from the incentive period’s end dates respectively for the disbursement of the $20 credit into your Hitch Driver wallet. Have questions? Email us at support.sg@grab.com with subject “HitchNTUAlum” and we will get back to you in 2-3 business days.